Everyone has a dream wedding. It’s an important milestone you’ve waited for all your life. Whether it’s a simple civil wedding or an extravagant church wedding, you can’t wait to celebrate this day with your soulmate along with your loved ones. But preparing for your wedding day is not all beers and skittles. You also need to know the legal documents and preparations required to ensure a hassle-free celebration. 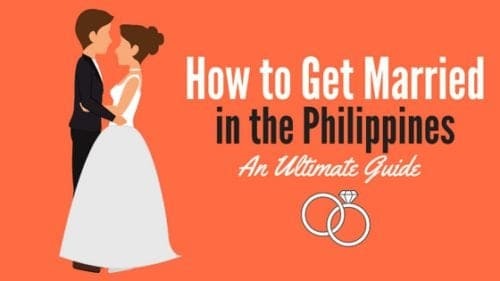 If you’re clueless about the things you need to know to get married here in the Philippines, no need to fret. We have scoured the Internet for the best information that every soon-to-be couples ought to know. How to Get Married in the Philippines in 3 Simple Steps. 1. Get a marriage license. Requirements for Marriage License Application. How to Get a Marriage License in the Philippines: 5 Steps. 2. Choose between a religious or civil wedding ceremony. Option 1: Civil Wedding in the Philippines. How to Have a Civil Wedding in the Philippines: 6 Steps. Option 2: Church Wedding in the Philippines. 3. Obtain your marriage certificate. How to Get Marriage Certificate in the Philippines: 7 Steps. 1. How can I get married in the Philippines with a foreigner? 2. How can we apply for a marriage license if one or both of us work abroad (with limited vacation leaves)? 3. Who are exempted from getting a marriage license? 4. I’m a Catholic but my partner is not. Can we still get married in a Catholic Church? 5. If a couple decides to have a civil wedding before church wedding in the Philippines, is the latter considered a “renewal of vows”? 6. If we are already civilly married and then decide to get married in the church, do we need to apply for a marriage license again? Marrying parties should be a male and a female, at least 18 years old. If you or your partner is 25 years old or below, a parental consent or advice is needed. You and your partner must not be related by blood (up to 4th degree) and should be free of legal impediments, such as being in a previous marriage (unless annulled, widowed, or divorced). After confirming that both of you are qualified to get married, proceed to the next steps. The marriage license is the most important legal document you need to secure when preparing for your wedding. After all, you won’t be allowed to have a church or civil wedding without this. To apply for the license, both parties must go to the local civil registrar of the city, town, or municipality where either one of them habitually resides. The marriage license is usually released 2 weeks (10 days) after you apply for it. Local civil registrars tend to interpret the guidelines differently so depending on where you’ll be applying, it may take either 10 consecutive days (including weekends) or 10 working days (excluding weekends) before the license is issued to you. Anyone of the applying parties can pick up the marriage license from the local civil registrar. No delivery option is available as of this writing. 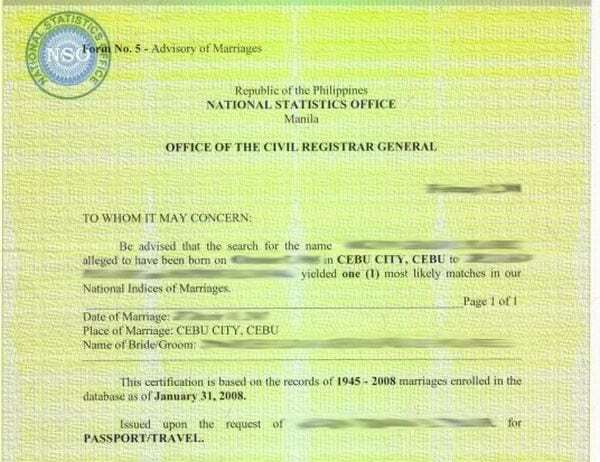 Once issued, the marriage license can be used wherever you want to get married in the Philippines. a. Personal appearance of the applying parties. b. 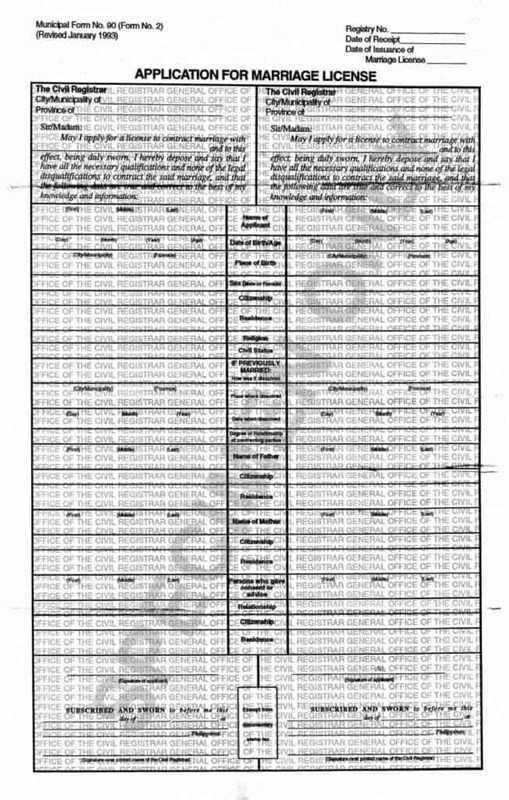 Latest certified true copy of you and your partner’s PSA birth certificates (original and photocopy). You can obtain this from the Philippine Statistics Authority (formerly NSO) office or through online application via e-Census. If no record of birth, the latest original copy of baptismal may also be accepted. Foreigners must obtain their birth certificates from their country of origin. c. Notarized affidavit of parental consent or advice for applicants below 25 years old. The legal age for marriage in the Philippines is 18. For applicants between 18 and 21 years old, a notarized parental consent is required (under Art. 14 of the Family Code of the Philippines). The father, mother, or guardian (in the order of mention) can either personally appear with valid ID (original and photocopy) or provide notarized consent. Meanwhile, for applicants between 21 and 25 years old, notarized parental advice is necessary. The parents or guardian is likewise required to either show up with a valid ID (original and photocopy) or just provide a notarized written account expressing that they’re aware of the couple’s intent to marry as well as any other advice they wish to give. Forms are usually available at the local civil registrar/city civil registry department where you’ll file the application. In case the parents refuse to provide notarized parental advice, you may submit a sworn statement telling the reason why they refused, after which the marriage license can only be issued 3 months after you filed the application. d. Latest Certificate of No Marriage (CENOMAR) or Certificate of Singleness (original and photocopy). For couples above 25 years old, the CENOMAR provides proof that neither of you was married before. To secure a copy, please follow the same procedure in ordering birth certificate–either walk-in at the nearest Census Serbilis Center or apply online via PSA Helpline. A copy of CENOMAR costs Php 195 (walk-in) or Php 430 (online). e. Certificate of Attendance in a pre-marriage counseling, family planning, and responsible parenthood seminar (if applicable). Most local civil registrars only require couples to attend the seminar if they’re 24 years old or younger. Pre-Marriage counseling is usually conducted by the Church or the DSWD for civil marriages. The family planning and responsible parenthood seminar, on the other hand, is held at the health department (specifically the Division of Maternal and Child Health) of your municipal/city hall. In most areas, family planning and marriage counseling seminar are combined into one program and conducted at the same venue. Be sure to check the schedules as some are conducted daily while others have a specific schedule within the week. Note: Young couples are required by law to attend the seminar. In fact, bypassing the pre-marriage seminar is grounds for annulment. f. Valid ID (original and photocopy). The valid ID should show proof that one or both of you are resident/s of the city/town/municipality where you’re applying for the marriage license. For example, if you’re filing an application in Manila, the valid ID must show an address in Manila. g. 2 pieces recent ID picture with white background (2 x 2 or 1 x 1, depending on your local civil registrar). Most local civil registrars no longer require pictures but better be prepared just in case they request for it. h. Community tax certificates or CEDULA. You can obtain the CEDULA at the same city/municipal hall where you’ll file the marriage license application. i. Marriage license application form (issued by the LCR office). Certificate of Legal Capacity to Marry (Affidavit or Affirmation of Marital Status for British applicants) issued by the Consular Office/Embassy of the foreigner’s country. If you’re a US citizen, the Consulate is prohibited by law to make any certification about your eligibility for marriage in the Philippines. They can only provide an Affidavit in Lieu of Certificate of Legal Capacity to Marry which you can obtain by appointment from the US Embassy in Manila or through walk-in application at the US Embassy in Cebu. Photocopy of passport (showing the Date of Arrival and Data). If annulled, Certificate of Finality of Annulment from the Court (1 original and 2 photocopies) and Certificate of Registration from the Local Civil Registrar (1 original and 2 photocopies). If widowed, Death Certificate of the deceased spouse. Some city halls may also request for Barangay Clearance. Get an application form (Form 90) from the local registry office. Fill out the form. The left portion of the sheet should be filled out by the groom while the other half by the bride. Submit the necessary documents (see the list of requirements above) together with the duly accomplished application form. To avoid hassles and long queues, go to the municipal office either in the morning or right after lunch. Attend the pre-marriage counseling, family planning, and responsible parenthood seminar. Submit the certificate of attendance and return on the date indicated on the claim slip. Wait for 10 days before the marriage license is released. Once issued, you can get married anywhere in the Philippines within 120 days from the date of issue. 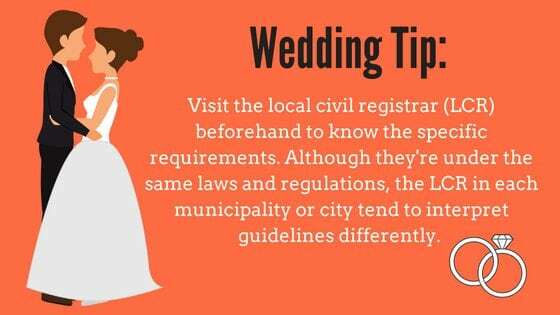 Depending on your budget or preference, you may choose between a religious wedding ceremony which is held in a church or civil wedding ceremony held in a municipal court, mayor’s office, or even the Supreme Court of the Philippines. For most Filipinos, a civil wedding is a cheaper, faster, and more convenient alternative to a church wedding. It is usually conducted by a judge of the RTC court, but it can also be performed by the mayor of a city. If you’re short on cash or still saving up for your dream church wedding, this option is for you. Possible requirement: Letter of Intent to Marry. As the name suggests, this letter should express your intent to marry and also includes your name and your fiancee’s name, your signatures, and your suggested wedding dates. Go to your civil registrar’s office to apply and pay the required fees for a marriage license. Beware of swindlers. Make sure you only deal with the staff of the Civil Registrar’s office. Proceed to the Mayor’s office and submit the Letter of Intent to Marry (if applicable) together with the marriage license to the secretary. Wait for the confirmation that your suggested wedding dates are available. Civil weddings are usually officiated by a judge or the mayor in a city hall court. If you have a preferred venue, seek the approval of your chosen officiant first. Find at least two people within the legal age who will serve as your witnesses. If either you or your partner is below 18 years old, a parent or a guardian is required. On your wedding day, you need to pay a filing fee which usually costs 100 pesos. This is to enable them to forward their own facsimile of the marriage contract to the local civil registrar. You will then get the facsimile of the marriage certificate from PSA (formerly NSO) after 1 to 2 months. Proceed to the official civil wedding ceremony. Update: We have written a definitive guide to a civil wedding in the Philippines which includes the requirements and all the essential steps to get married in a civil ceremony. Every Filipina bride has a dream of tying the knot in the church and wearing that long, elegant wedding dress. 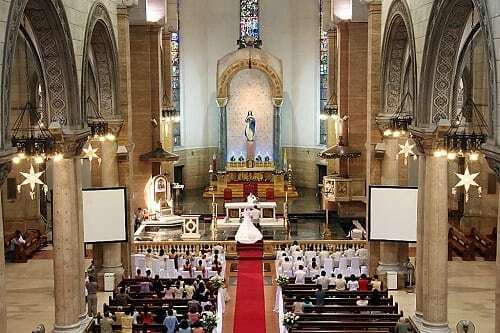 And because the majority of Filipinos are Catholics, it’s no wonder why most prefer to get married in popular churches like Manila Cathedral, San Agustin Church, and the likes. If you’re one of those lucky few who has a budget for a church wedding, there are specific requirements aside from the marriage license that you need to fulfill a few months before your actual wedding. This is because the documents listed below have different validity periods and it’s your responsibility to ensure they don’t expire before your scheduled wedding date. The document must be valid and not expired. If you previously married in a civil wedding, you must submit a registered marriage contract. b. Baptismal and confirmation certificates (6 months validity). Because marriage is one of the church sacraments, you and your partner must submit a proof that you have previously received the sacrament of baptism. The copies that you’ll submit must be new and with an annotation “For marriage purposes only.” Depending on the church, you may be required to submit these upon application or 2 – 3 months before your wedding date. Some parishes can’t issue these documents instantly as they don’t have digital records of these files yet. Make sure to process these papers as early as possible. c. Latest Copy of PSA birth certificate and Certificate of No Record of Marriage (CENOMAR). You can secure these documents either online (recommended for those based abroad) or by going to the PSA (formerly NSO) office. Most churches accept birth certificates as long as they are still within 6 months from the date of issuance. This is when you and your partner will meet the parish priest (or his assistant) of your chosen church. Request to the church coordinator to have the interview scheduled 1 to 2 months before your wedding. The parish may also send you a list of questions before the interview to give you more time to prepare. During the interview, the priest will explore your decision to get married by asking questions about your family background, how long you have known each other, and so forth. Because marriage is a lifelong commitment, this seminar is provided to help couples learn more about each other, resolve any issues prior to getting married, and gain insights about their future life together. Topics may include parenting, sexuality, family planning, among others. Although most parish churches conduct the seminar every month, you should still ask the church coordinator about the schedules to make sure you won’t miss it. Some churches also recognize other independent organizations like Catholic Engaged Encounter (CEE), Center for Family Ministries (CEFAM), and Discovery Weekend Philippines (DW) which provide seminars or retreats for couples. If you attend seminars from any of these, you need to submit certificates of attendance as proof. If either you or your partner is currently based abroad, a certificate of attendance from the local parish is enough. These are written wedding announcements that will be posted on the bulletin boards of the couple’s respective parishes. To obtain the marriage banns, both the bride and groom must know the specific name of their respective parish priest and the address of their parochial church. After receiving this information, the wedding church will then prepare a letter requesting for the marriage banns. The banns are posted in the couple’s parishes for three consecutive weeks, which explains why you need to complete the wedding requirements at least a month before the event. Afterward, you can now retrieve the letter from the parish office with a reply indicating that no impediments exist and that the wedding can push through. g. List of principal sponsors and entourage members (a.k.a. “ninongs” and “ninangs”). The copy of the wedding invitation along with the official list of entourage members should be submitted to the parish church where you’ll get married a week before your wedding date. Make sure to ask the church for any restrictions or additional requirements before finalizing the list. Some churches, for example, only allow a maximum number of principal sponsors and you may get fined if you go overboard. Note that the names of the principal sponsors are important as they will be included in the marriage license. h. Wedding or marriage permit. Also known as Certificate of Freedom to Marry, this document may only be required for those who are based abroad. While CENOMAR is required before you can obtain a marriage license, the Certificate of Freedom to Marry is a requirement of the church itself. You need to obtain it from the parish where you usually attend. Requirements and fees may vary from one parish to another so contact your church abroad directly. Some churches require couples to attend confession days before the wedding. Through this event, they will be forgiven of their sins and receive the most out of the sacrament. j. For those who have been previously married in a Catholic church, you also need to secure annulment clearance paper from your Archdiocese. This annulment process is done to declare the previous church wedding as null and void. It’s different from the civil rites annulment process that legally changes the status of your previous marriage as invalid. k. For “mixed marriages” where the other party is a non-Catholic, you need to get Clearance from the Archdiocesan Chancery Office at the Archbishop’s Office, 121 Arzobispo St., Intramuros, Manila. To obtain this document, the non-Catholic bride or groom must submit Letter of Approval from the Pastor of the non-Catholic sect that not only approves the marriage but also declares the person has never been married before. For foreigners, Legal Capacity to be Married issued by the embassy and Dispensation of Approval from the Parish Priest where the person currently resides are required. For a complete list of requirement, contact the Archbishop’s Office directly. l. For widow or widower, bring a copy of the death certificate of the deceased spouse and present it to the parish church. m. For renewal of vows, present a copy of the Catholic Marriage Contract. ID pictures. Size, color, and the number will depend on your church’s requirements. List of songs, if applicable. Permits for photographers and videographers, if applicable. Note: If you have other questions, please contact your city hall or church directly. Know the exact date and time when all the requirements will be released so you can plan your wedding, hassle-free. A marriage certificate is an important document containing details of your marriage, signed by the couple and witnesses or all in attendance. Fortunately, you can apply for a marriage certificate online and have it delivered anywhere in the Philippines or abroad in a few simple steps. 3. Enter your name and contact details to the “Contact and Delivery Information” form. In the Delivery address, you can choose the specific country and address where you want the marriage certificate to be delivered. 4. 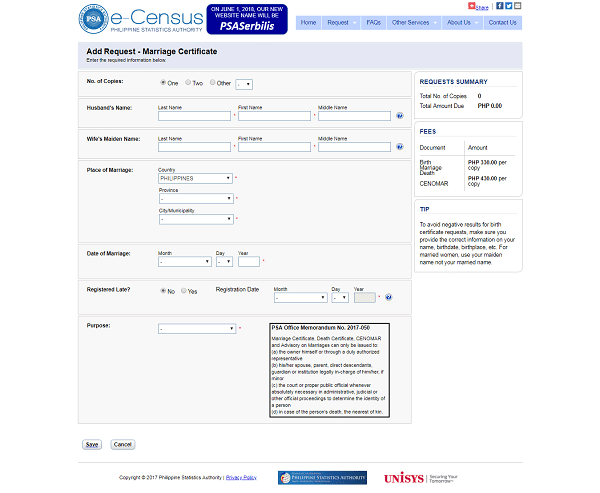 Add a request by clicking the button that corresponds to Marriage Certificate. Husband’s name or wife’s maiden name. Place and date of marriage. 6. Upon completing the online application, you will be issued a Batch Request Number and a corresponding Batch Reference Number. When paying for all requests in a batch, indicate the Batch Request Number. 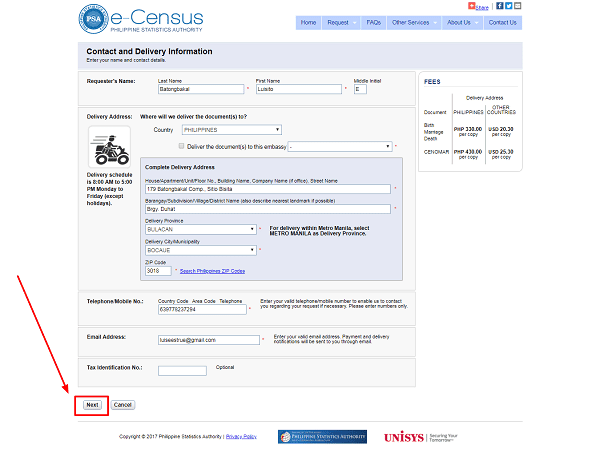 If you’re only paying for a particular request only, specify the Batch Reference Number. As of this writing, marriage certificate costs Php 330 per copy which is inclusive of government taxes, processing, and delivery. If you’re applying from another country, the cost is USD 20.30 per copy. BDO Branches, Online Banking (BDO account holders only), and ATM (BDO account holders only). Unionbank Branches, Online Banking (Unionbank account holders only), and ATM (Unionbank account holders only). BDO Remit subsidiary offices and remittance partners abroad offering Kabayan Bills Bayad. 7. Wait for your marriage certificate to be delivered. 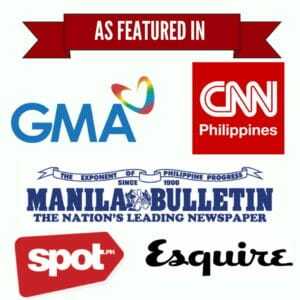 Metro Manila – 3 to 5 working days after payment. Cities or provinces within the Philippines – 4 to 9 working days after payment. Other countries: 6 to 8 weeks after payment. If you’re in the Philippines and you want to receive the marriage certificate within 1 to 2 days, you may apply in person at the nearest Census Serbilis Center. For those in other countries, a special courier service offers faster delivery. How to get married in the Philippines two foreigners, a Pakistani and US Citizen. Hi. I would like to ask if we can apply for a marriage license not in the Local Civil Registry where we reside. The Family Code of the Philippines states that the marrying parties should get the license from the city or municipality where either one of them habitually resides. Once you the license is issued to you, you can marry anywhere in the Philippines within 120 days. @Cassy The legal age of marriage is 18, regardless if the marrying party is a Filipino or foreigner. Good day, I just want to ask how to get married in the Philippines,i am a pilipina and my fiancee is German,what are the requirements needed for the Civil wedding? And how long it takes to process the paper? Thank you. If i ll going to marry a danish man by civil rights, the next step need to register in danish embassy? This is automatic registered in embassy. Would you know cities in Metro Manila which accept the affidavit of legal capacity to marry? Thanks for pointing that out. I have updated the article by removing that obsolete information. All Philippine agencies now accept the Affidavit in Lieu of a Certificate of Legal Capacity to Marry from US citizens since it’s the ONLY document that the US Embassy can provide. If my boyfriend get the.affidavit or legal capacity to marry in UK.do he still need to go to British embassy? Is there any chance any chance that I can get the affidavit/affirmation of marital status in the Philippine Embassy in the UK rather than waiting 10 days when i get in the Philippines? In the old system, British citizens could get a UK-issued Certificate of No Impediment (CNI) and then present it to the Embassy here for authentication. Now the Embassy only process the Affidavit/Affirmation of Marital Status which you can only obtain by booking an appointment online and appearing in person to sign the document in the presence of a Consular Officer here in Manila. You will then be issued the affirmation along with a letter addressed to the local civil registrar explaining the change from CNI to Affidavit. The whole procedure only takes 2 hours give or take. You also need to personally appear when applying for the marriage license so booking a flight to Manila is inevitable in your case. After application, you can go back to UK and have your partner here in the Philippines claim the license after 10 days, after which you can get married anywhere in the Philippines within 4 months from the date of issue. As a naturalised Brit, am I not able to use CENOMAR as I was a Filipino cotizen before? Hi Tom. We’re coming up with a detailed article about church wedding in the Philippines soon. It includes a breakdown of costs and other wedding planning ideas. Hi. Regarding on getting marriage license which is required the appearance of both parties, because we are based abroad and we plan to get married on April 2019, he is in Europe and me in Middle East. is there any chance that we can process the document thru online? since we cannot go home 2 or 3 months before the wedding because our employer only give us the month of our wedding. For the Canonical Interview is it done by the Parish Priest or the priest who will do the ceremony? because we choose the church but the priest is not the parish priest. For pre-cana seminar it says that local parish abroad is accepted, is it ok we have pre cana seminar in separate country? Your response will help us and this will be very much appreciated. 1. Although I understand your situation, personal appearance of both parties is really required in applying for a marriage license in the Philippines. Another possible option would be to have a civil union in the Philippine Embassy/Consulate who will take care of the marriage license and other paper works. Then, you can use the PSA marriage certificate for the “revalida” church wedding in the Philippines. If you do this, you no longer need to apply for a marriage license by the time you get here. Just submit your marriage certificate/contract and you’ll be ready for a church wedding. 2. Canonical interviews are usually done by the parish priest or the assistant parish priest (in case the former isn’t available). It shouldn’t necessarily be the one who will solemnize the ceremony. If the priest who will do the ceremony isn’t a resident of the parish where you’ll marry, the interviewer will simply ask for that priest’s celebret (a letter from the Catholic Bishop or religious superior testifying that the bearer is indeed a priest) and license to solemnize a wedding. 3. As far I know, pre-cana seminar should be attended by the couple. Better ask your local parish in that country if they allow that kind of setup. I don’t know how to make a comment because I have a question too, I just made a reply. My husband and I had a civil wedding last 2009 and we have a marriage certificate already from NSO. We are planning to have a church wedding next year. Do we still need the marriage license? And the pre cana and canonical interview is it done personally? We both reside here in Arizona.